Brooklyn Grange's Hot Sauce is made from peppers and herbs picked fresh from the farm and thrown straight into the kettle! Our recipe is packed with flavor, and spicy enough to tingle the taste buds. Organic vinegar lends a gentle tang to our sauce, and herbs from the field add floral and savory layers. Finally, a specially selected mix of hot and sweet peppers make our sauces a perfectly balanced blend. Caution: this stuff is addictive! Brimming with unique herbs, our tangy herb blend sauce has a citrusy tang followed by a subtly smokey finish. 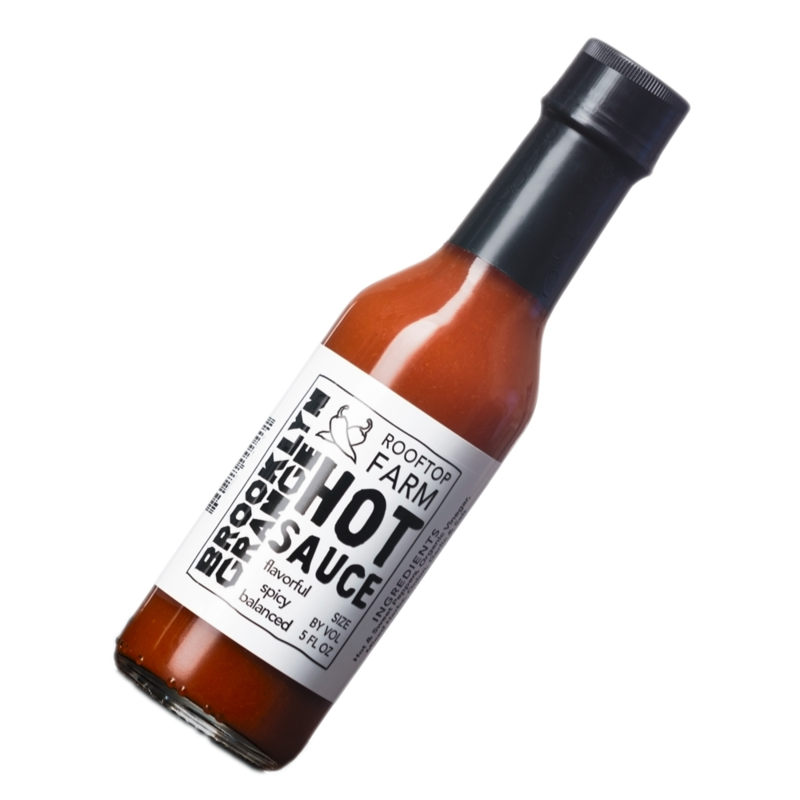 Perfect on barbecue, in a stir fry, or atop fish tacos, this medium-hot sauce packs in the flavor without overpowering your palate. We've bottled the very essence of farm-fresh chiles in our classic red hot sauce. Dozens of pepper varieties are blended, resulting in a slightly sweet, round flavor, with an unexpected firey finish. All of our hot sauce is sold by the pair. You will be asked to pick two classic red, two tangy herb blend, or one of each when ordering. The price for two bottles is $16 plus $8.00 flat rate for shipping for a total of $24. We ship to the lower 48 only (we do not ship to AK, HI, or internationally). "This sauce has developed a cult following amongst Brooklyn locals for a super fresh flavor that comes from using the most local produce possible, including Brooklyn's greenest herbs!" For wholesale customers looking to purchase our hot sauce by the case, please contact us at info@brooklyngrangefarm.com.